Lots of you have expressed an interest in creating scenes….but wanting something quicker and easier to do when making multiple cards for Christmas. Well, I have a tree idea for ya! 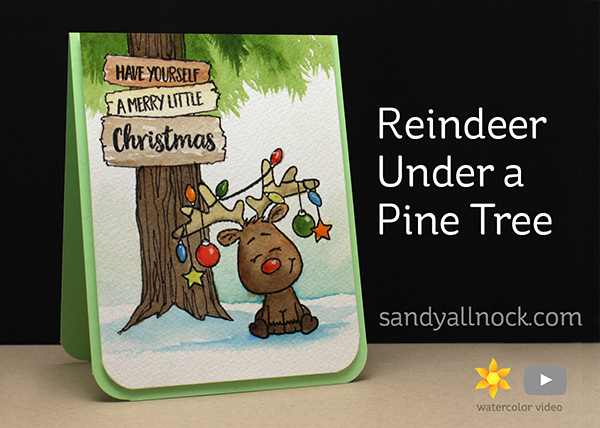 This cute little reindeer sits happily under his tree, and could be colored with any medium – but I’m using watercolors today. Enjoy! Watch the video below or click HERE to see it in HD on YouTube. I’ve loved this little guy from the first time I seen him.I love the tree. Cute card. I love the little scene you’ve created. What a sweet Christmas card, love all your videos and thanks for the watercoloring tips. Even if you’ve addressed a watercolor technique before in another video, the reminders of those tips in videos like this one are helpful to reinforce the technique for me, a beginner. I love your creativity, this is adorable! Stunning! I love your work and your voice over, its always fun to see and hear you, thank you Sandy! Sandy this is such a sweet card, I love watching you create a scene with a paint brush. Just wonderful! I love watching your videos, you inspire me. 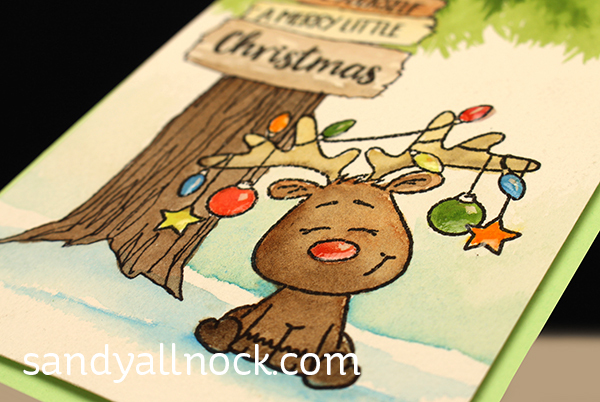 Your reindeer card is just adorable and I always like how you add to it without a stamping. Wow! I LOVE this cute little reindeer! Adorable! Oooohhhhh, I love that scene….. and of course your watercoloring! I also smile because you have trained my eye to see the great results when using Arches watercolor paper! I knew at first glance, and didn’t even have to read the supply list. WHAT – no more Quin Gold – I’m speechless – gonna have to start buying up what you didn’t! Love the tree Sandy – really fun. As always, just a fun way to start the day – and Gerda Steiner’s stamps are just plain fun. Love the way you “recovered” from the bit of green in the background sky – great idea! The signage is another great idea – and I’ve been using it from time to time – so easy and quick! Can’t thank you enough for all you do! I just saw this stamp set and thought he was adorable and your card made him even more adorable.